WINSTED – Jeffrey Paul Mogob, 64, passed away unexpectedly on Wednesday, October 3, 2018. He was the loving husband of Pauline Maryann (Madore) Mogob for 44 years. Born May 12, 1954 in Torrington; the son of the late Paul and Rosemarie (Adams) Mogob. 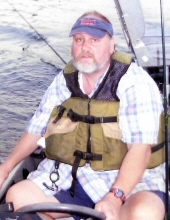 Jeff was a great fisherman and hunter who enjoyed the outdoors. He was an avid UCONN Women’s Basketball fan. He loved spending time with his grandchildren and he will be deeply missed. In addition to his wife, he leaves his children, Sandra Silva and husband Jose and Daniel Mogob and wife Amanda, all of Torrington; cherished grandchildren, Coby, Morena, Nathan and Ryan; brother, Timothy Mogob; sisters, Betsy McKaige and husband Stuart and Marie Williamson; and many nieces and nephews. Friends may call on October 13, 2018 at Montano-Shea Funeral Home, 922 Main Street, Winsted from 2 – 4 PM. Burial will be held at the convenience of the family. Visit an online guestbook at montano-shea.com. To plant a tree in memory of Jeffrey Paul Mogob, please visit our Tribute Store. "Email Address" would like to share the life celebration of Jeffrey Paul Mogob. Click on the "link" to go to share a favorite memory or leave a condolence message for the family.